Oppenheimer concludes that, since UCT is a publicly funded organ of the state, it must respect, protect, promote and fulfil the rights protected by the Bill of Rights, including the right to freedom of expression and academic freedom. It also protects against discrimination based on ethnicity, religion, and language. This Bill of Rights is the cornerstone of democracy in South Africa. It enshrines the rights of all people in South Africa and affirms the democratic values of human dignity, equality and freedom. The right to receive or impart information or ideas and freedom of scientific research are unequivocally protected in the right to freedom of expression. If adopted, the decision would not only violate students’ and academics’ right to freedom of expression and, critically, academic freedom, the proposal singles out Israeli institutions, which include Palestinian or Islamic institutions. Since an overwhelming number of staff and students in Israel are ethnic Israelis, are Jewish by religion and speak Hebrew by language, the effect of the policy would constitute direct and unfair discrimination on the grounds of ethnicity and religion, and thus contravene section 9 of the Constitution. This is particularly unwelcome in the context of South Africa’s apartheid history of discrimination. 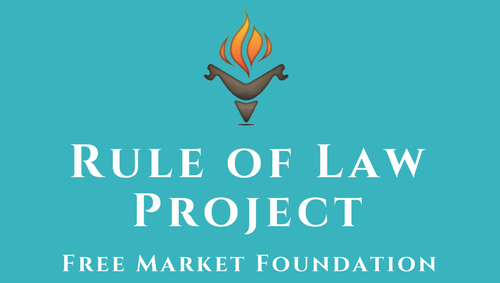 The Rule of Law Project is an autonomous unit of the Free Market Foundation (FMF). The FMF is an independent public benefit organisation founded in 1975 to promote and foster an open society, the rule of law, personal liberty, and economic and press freedom as fundamental components of its advocacy of human rights and democracy based on classical liberal principles. The FMF regards the Rule of Law as an indispensable vehicle for the achievement of a free and prosperous society. The Rule of Law Project, formally established in 2016, is meant to give effect to this commitment. The Rule of Law Project exists to give substance to section 1(c) of the Constitution of the Republic of South Africa, which provides that South Africa is founded upon the supremacy of the Constitution and the Rule of Law.